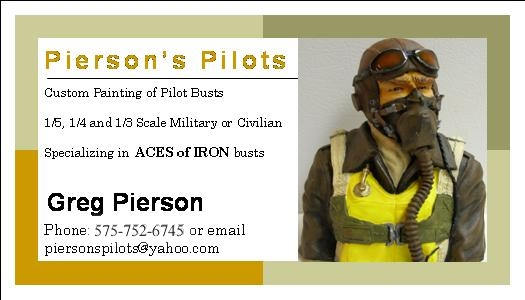 Over the years, we have received many requests for painted pilots and we have yet to find a production paint scheme which can do the figures justice at a reasonable cost. Usually, you can ask around your flying field an find several volunteers to paint the figures. There are also several individuals around the world who offer painting services. We will try to maintain a list of people who provide such services here. NOTE: The providers listed herein are not affiliated with Aces of Iron. If you provide painting services and would like your contact information listed here, please e-mail us information (preferably in the jpg. format as shown below) and any other pertinent information (link to website?) to info@acesofiron.com. In an effort to limit site maintenance, Please do not provide price information.